(Matt Agorist) Since late 2016, in instance after instance, the narrative on Russia hacking the election has been slowly exposed as a massive farce. Last year, that slow crawl toward death turned into a full on sprint as CNN, not once, but twice admitted that they pushed fake Russian news with no proof — for ratings. Shortly after CNN, in their magnificent fall from the fake news pedestal, the New York Times quietly admitted their ‘bombshell’ backbone to the entire Russian narrative was simply not true. 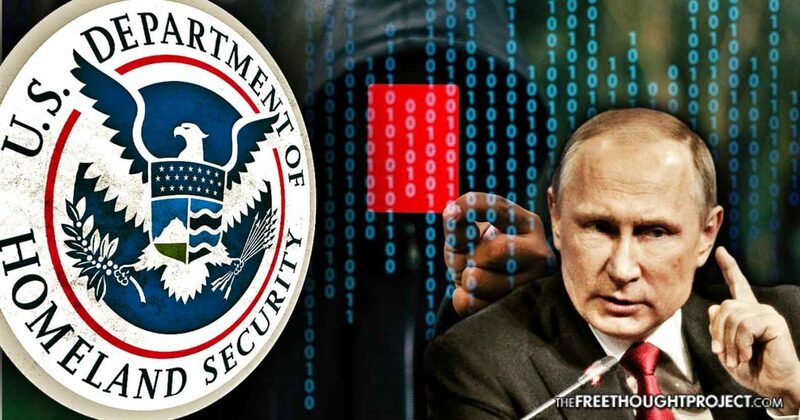 Now, the Department of Homeland Security has even stepped in to lay the rumors to rest put out by NBC last week claiming that Russia “successfully penetrated” the voting system in several states. However, this week, Manfra came forward to call NBC out for spinning her words to make it seem like the US had been hacked. “Recent NBC reporting has misrepresented facts and confused the public with regard to Department of Homeland Security and state and local government efforts to combat election hacking,” DHS cybersecurity chief Jeanette Manfra said on Monday. Despite the fact that Manfra said an “exceptionally small number” of states were targeted successfully, NBC’s headline on its website reads “Russians penetrated US voter systems, top US official says,” which Manfra has accused of being misleading. NBC has yet to issue an update on their story and, in fact, has fired back—in spite of the National Association of Secretaries of State (NASS), which represents a group of chief election officials—who have similarly criticized NBC for misleading reporting. “It’s hard to believe DHS actually watched or read NBC’s report. Our story is accurate, and makes all of the very same points this statement accuses us of not making,” an NBC spokesperson told the Hill. Whatever the blowhards in the media and the government claim over Russian hacking, the fact remains that they have presented no proof to the people. In fact, last year, even the former director of the FBI, James Comey admitted he never once saw any of the evidence of Russian interference in US elections. Senator Richard Burr, (R) North Carolina opened the inquiry into Comey in June of last year. After a series of entirely led questions which allowed Comey to assert — over and over again — that he has “no doubts Russia interfered with the US election,” Burr asked the most important question of all. He wanted to know if Comey had ever seen any evidence of the interference. What makes this case all the more ironic is while DHS is now claiming the facts have been misrepresented on Russian election interference, in late 2016 and early 2017, they were accused of doing the hacking. As the Free Thought Project previously reported, the Department of Homeland Security, under the Obama administration, attempted to hack the Indiana State electoral system nearly 15,000 times. Prior to the hacks in Indiana, it was the state of Georgia that exposed DHS meddling in their elections. In reality, the case against Russia, as we’ve previously reported, is alleged to have been contrived mere moments after Clinton lost the election. Last year, WikiLeaks detailed the contents of the book “Shattered” — written by Jonathan Allen — which lays out the plan quite clearly. Wikileaks uploaded a picture from a page of Allen’s new book which destroys the Russian hacking narrative immediately. New book by 'Shattered' by Clinton insiders reveals that "blame Russia" plan was hatched "within twenty-four hours" of election loss. The page uploaded by Wikileaks explains how the Clinton spin machine was set in motion in the minutes following her loss to Trump. Allegedly, John Podesta (Clinton’s campaign manager), collaborated with Robby Mook (fellow member of the Clinton campaign) to make the argument the election was rigged by the Russians — an argument which was put forward when it was revealed in early 2016 the Democratic National Committee’s emails had been hacked. The narrative has spiraled so far out of control that even the Trump administration is fear mongering over it now. Last week, Secretary of State Rex Tillerson went on FOX News to pump fear into the right over Russian meddling in the US elections. Despite the constant tornado of half-truths, lies, and propaganda filling the airwaves, even some of the mainstream media has been forced to admit it is all a facade. On a broadcast of MSNBC’s “Rachel Maddow Show” last year, Andrea Mitchell, NBC’s Chief Foreign Affairs Correspondent and the host of MSNBC’s “Andrea Mitchell Reports,” stated a fact which went under the radar and contradicted everything they reported this week, but lays it all out perfectly clear — Russiagate is a “conspiracy theory” created by Hillary Clinton.